In the evening of 17 June 2013, the second level court in Bishkek acquitted the three Kyrgyz MPs who were charged with an attempt to illegally usurp power in the country. Kamchibek Tashiyev, Talant Mamytov and Sadyr Japarov walked out of the preliminary detention facility they were in keeping their Member of Parliament status and the relevant immunity intact. Some analysts in Kyrgyzstan and abroad assume that this could set in motion the largest political crisis in three years [since the last revolution in 2010]. In fact, a big battle ensued for the MPs’ release: in early June, MP Tashiyev’s relatives and fellow countrymen blocked the strategically important motorway, which connects the country’s south with north. While the authorities had to somehow agree to the terms of those blocking the road, in the MPs case, they had to rule to consider the time they spent detained for time they allegedly served (the three MPs were at the preliminary detention facility of the State Committee for National Security since October 2012). However, they were declared “clean” and, based on the information we have, the announcement is a very unpleasant surprise for the Almazbek Atambayev administration. Judging on how the case was tried in court, the president’s team was most probably expecting the previous verdict would be stepped up, not cancelled. Actually, the Kyrgyz society sees nothing new in the releases of even most odious criminals lately; the judges are not motivated by justice feelings apparently and are “encouraged financially” to acquit or releases notorious criminals either from prison or even the courtroom. In spring, Aziz Batukayev, an individual known as a “criminal in law” was released due to “health concerns” and he was quick to leave for Russia. 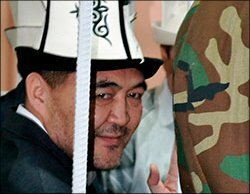 On 28 May 2013, the Osh Regional Court acquitted Kadyr “Django” Dosonov, one of the most notorious criminals in Southern Kyrgyzstan. The list goes on. However, the MPs’ release must have been secured by far more important power centers, which are capable of not only providing a significant financial stimulus but can also guarantee security for those making their decision on acquittal. The freed opposition MPs were quick to say they are going to make a very harsh political statement at a nearest parliamentary session. Perhaps they are going to demand again to immediately nationalize the Kumtor goldmine. The demand was the very reason that eventually led to their arrest following a rally in Bishkek in October 2012. Analysts in Bishkek also draw attention to the fact that the U.S. Justice Department dropped the case against Maksim Bakiyev, the former Kyrgyz president’s son. The USA is no longer seeking his extradition from the United Kingdom. One cannot rule out the possibility that certain agreements have led to this and the Americans will not have to spend their taxpayers’ money to impact the internal processes in Kyrgyzstan. After all, the Bakiyevs family did haul away large amounts of money before fleeing the country. It is extremely important the Kremlin to properly choose a mode of action in this situation. Russia has been consistently stating that it favors the withdrawal of the American base from Kyrgyzstan. Russia is bound with Kyrgyzstan on certain obligations with the Collective Security Treaty Organization and other bilateral agreements reached last fall. These documents state that in case the constitutional order in Kyrgyzstan faces threats, Moscow has the right to get directly involved. One could assume that the Kremlin can extend a helping hand to President Almazbek Atambayev in case mass riots ensue; especially when foreign actors’ inspiration of those is apparent. But what form will such assistance be delivered in? Is it not too late anyway? There are no answers to these questions at the moment.